Following a very good keynote by Jane Secker in the morning – Copyright and e-learning: understanding our privileges and freedoms (which again I urge you to watch), I attended a session which had 4 excellent talks, and to support Emmanuel Isibor of Aberystwyth University who presented his findings around VLE design and enhancing learners’ experience. Also presenting during this session was the ALT LT team of the year from LSE presenting on the role and responsibilities of Learning Technologist in their Learning Spaces project. I really enjoyed hearing about Matt Cornock’s work looking into “Strategies for supporting effective student engagement with lecture recordings”, and also Leonard Houx’s presentation about “Designing for Flow”, where he smashed into the awful VLE UX we’ve all had to put up with over the years! Daniel mentioned that the students reacted positively in the main and surprisingly, students felt that the level of interaction with staff was similar to face to face sessions. We will be looking to make staff aware of these issues when discussing the use of the webinar this academic year. To be honest, this is one of the sessions I looked forward to the most from the whole 3 days. 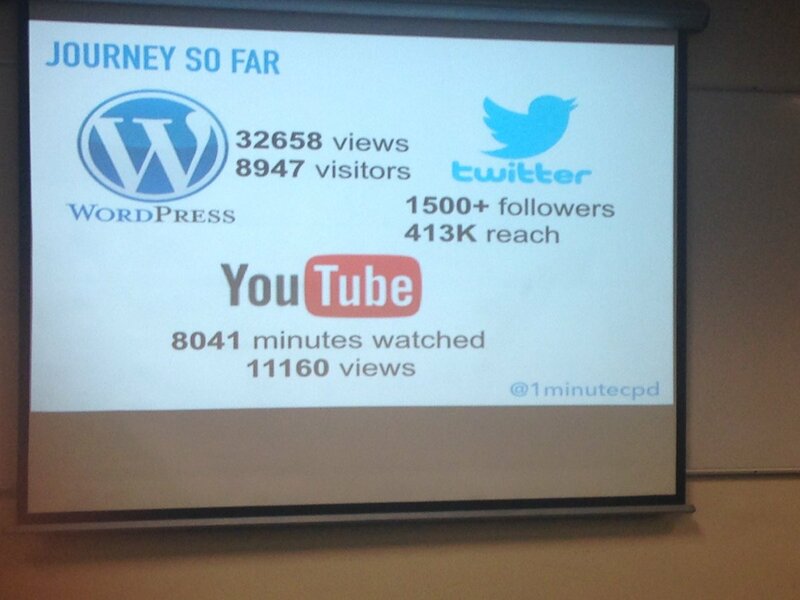 I’ve been a big fan of the 1 minute CPD project for a while now. It’s a simple idea, but so effective. As we all know, the main barrier for technology adoption is time. Time to learn the what, the why and the how. Even when we run training sessions, we know that there is still a time barrier for staff to actually sit down, digest what they have learnt and then put it into practice. As it suggests, the resources are reduced to one minute each, and where there are larger topics (being realistic), they can be grouped together as a short series. 5 are released per week, and the whole site and resources are completely open. The stats were also impressive considering that there was absolutely no budget for the project whatsoever. The next steps for the project include library collaboration content created for students, and also student created content. They’ve had interest from all over the country (and world! ), and I’ve really been impressed with their fresh thinking around TEL CPD. You should definitely visit their website and learn a thing …or two. There are many lines I could quote from the keynote, but I think the presentation should be viewed, so I’ve embedded it below. I’ll finish with this: “We need to remember that there is no such thing as “the university” as we are “the university”. With this comes responsibility. Responsibility to think, talk and act in regard to teaching and learning. Thank you Dewi for sharing the final keynote video. It’s worth of watching for sure. I’d encourage you to share it with different Yammer groups in the University. It should be learned not only by learning technologists but by everyone works in the Univeristy, especially those who take more leadership roles. Donna and Dave clearly pinpointed the fundamental ‘views’ that we have (we may have realised, or we haven’t realised, or we need to develop our own abilities to realise, or we don’t want to realise) which build up our institution, cultrure, and rules…. I am motivated by this speech at the moment.